Did you know that you have more than one credit score? Did you know that your income doesn’t affect your credit score at all? 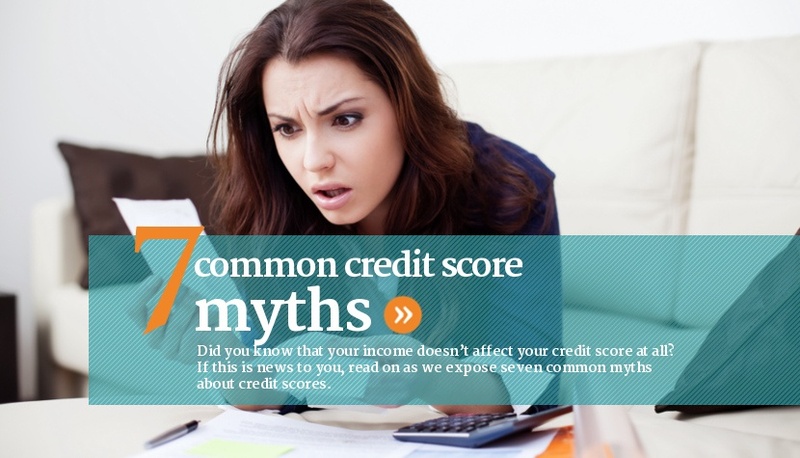 If this is news to you, read on as we expose seven common myths about credit scores. In Canada there are two credit reporting agencies, Equifax and TransUnion. These agencies create credit reports and credit scores for Canadian consumers based on the information that creditors supply to them. Unfortunately, not every creditor reports their information to each of these agencies. A creditor may report to one agency and not the other. Creditors may also only update the credit agencies with your current information once a month—or less often in some cases. Consequently, Equifax and TransUnion may not have exactly the same credit information about you, nor do they use the exact same software to calculate credit scores. This will mean that each of these agencies will generate a different credit score for you based on the information that they have on record for you and how their software evaluates the information they do have for you. You can get a free credit report each year from both Equifax and TransUnion, but you usually have to pay to find out your credit score. If you don’t want to pay, but you would like a rough idea of what your credit score is, you can get a general idea with this credit score estimator tool. A number of companies and organizations are also now offering credit scores for free now as well. These include Credit Karma (in exchange for your score they share your financial information with advertisers) and RBC (the Royal Bank) who is providing their customers with free credit scores. Whenever you apply for credit or open a new bank account, the banker will ask for permission to check your credit. At this time you can ask them what your credit score is. You can also ask them to tell you the strengths and weaknesses they see on your credit report if you want to improve your credit score. To get your free credit report right now, click here to find out how. Your occupation and your income are not part of the credit scoring formula. Even if you are rich and famous, it doesn’t matter. Your occupation may or may not be reported to the credit reporting agencies when a creditor or lender requests a copy of your credit report, and your income is never reported—there isn’t even a place to put it on your credit report. Having a stable job and a good income is very important to lenders, but it has nothing to do with your credit report or your credit score. Your credit report only shows your payment history and credit behaviour, not your payment potential. The credit reporting system is similar to the driver’s licensing system in that everyone has their own record. No one shares a record. If a policeman pulls you over for speeding, you can’t get the policeman to put the ticket on your spouse’s driving record. It goes on yours if you are at fault. The same is true with your credit report. If the debt is only in your name and you are late with your payments, the late payments are only reflected on your credit report. However, if a debt is joint, then the late payment notation goes onto both credit reports. If you and your spouse are joint on all of your debts, then it is possible that you will have similar credit scores, but it is still unlikely that your scores will be the same for a number of reasons: the length of time each of you has had credit is probably different, you may have had a debt in only your name within the last 7 years, and not all joint debts always report on each person’s credit report (yes, this is weird. It’s one shortcoming of the system). When a lender grants you and your spouse credit based on a joint application, they are approving the loan credit application based on the fact that two people have promised to repay the debt. Just because you no longer live with your spouse or are divorced from your spouse does not change anything from a lender’s point of view. If you want to change who is responsible for a debt, you or your ex-spouse must either pay out the debt with a new loan or re-qualify for it in only one person’s name. If you don’t do this and leave the debt as it was, you remain fully liable for the repayment of that debt. If you thought that your ex-spouse was making payments on that debt, but the creditor informs you that they have stopped making payments, then it is your responsibility to continue those payments. If it took the creditor a while to track you down, your credit could be damaged by the missed payments that you didn’t know about. So your credit score can be impacted by your ex-spouse if you still have any joint debts with them because a divorce only dissolves a marriage agreement, not a joint borrowing agreement. If you go bankrupt, a record of the bankruptcy will remain on your credit report for 6 to 7 years depending on which province you live in. During that time, the bankruptcy notation will negatively impact your credit score and make it difficult to obtain credit. However, after the 6 or 7 years, the bankruptcy record and all records of bad debts (that are the same age) will usually be removed from your credit report, and this will allow you to get a fresh start. If you are struggling with your debts and are considering filing for bankruptcy, there are many good bankruptcy alternatives that can work out much better for many people. Click here to learn more. While becoming debt free and staying debt free is a fantastic way to live, it’s not a silver bullet for your credit score. Your credit score is based on your credit behaviour and payment history, not just the amount of debt that you have. Not having any debt will help your credit score as long as you maintain at least one active credit account—like a credit card or a line of credit. If you don’t have any active credit, the credit scoring system doesn’t know how you are currently handling your obligations. If you use one credit card occasionally and pay it off completely every time you get the bill, then the credit scoring system can see that you are using credit responsibly. Knowing how the credit scoring and credit reporting systems work can help you make borrowing and credit decisions, however, credit scores can change monthly. There's no need to actively seek your credit score on an ongoing basis. Focus instead on managing your money, budget and debt carefully; your score will take care of itself. For more information about how your credit score is calculated, click here. How do parking tickets affect your credit? How to get a super credit score. 3 common ways people wreck their credit. You don’t have to be in debt to build credit. Myth: "I've got excellent credit because I pay all my debts on time."